Send Sky HD, Virgin Media or any HDMI source to another room with remote control up to 120m away using a single CAT5 or CAT6 network cable. Local HDMI output for connection to TV, no need to use an HDMI splitter. Supports IR remote control over HDMI, sensors supplied. Upto 5m HDMI cable can be used each end. Connect an HDMI cable from your Sky HD/Virgin box to the sender unit input. Plug in the power supplies and switch on. You can now enjoy HDTV on both TVs with remote control. Send an HDMI signal over a single CAT5 or CAT6 network cable, supports 1080p and 3D up to 60 metres. Send HDMI 50m over a single ethernet cable. Supports 1080p and 3D Max recommended distance 50m at 1080p when using CAT6 network cable. HDCP compliant. Easy to install, small compact size. Upto 5m HDMI cable can be used each end. Package includes Trasmitter unit, Receiver unit 2 x 5v power supplies. Ideal for extending Sky HD or Virgin HD to other rooms at full HD quality. Example setup for Sky HD Connect an HDMI cable from your Sky HD box to the sender unit. Connect a network cable up to 50m long between the send and receive units Connect an HDMI cable from the receive unit to the remote TV Plug in the power supplies and switch on. 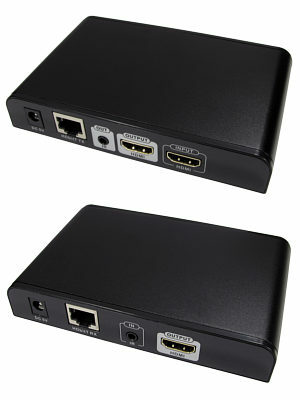 Can also be used with a 2 way HDMI splitter to watch Sky HD or Virgin on 2 TVs.